On December 23 of this year, the Federal Reserve will be 99 years old. And throughout that 99 years, regardless of boom, bust, recession or Great Depression, the biggest Wall Street banks have been enjoying a 6 percent, risk-free return on the capital they hold at the Fed in the form of dividends. Have you looked at your checking or money market bank statement lately from JPMorgan Chase or Citibank? How about the statement showing the interest you’re earning on your mortgage escrow account with the big banks? While the country suffers through the lingering effects of the Great Recession caused by the biggest Wall Street banks, the public typically receives less than 1 percent on their deposits at the big banks, while the government has legislated a permanent, risk-free 6 percent guarantee to the Wall Street banks for their capital on deposit at the Fed. Now that’s an entitlement program that needs to die! The Fed requires that its member banks subscribe to “stock” in an amount equal to 6 percent of their capital and surplus. The banks have to post half that amount with the Fed upon becoming a member; the other half is subject to call by the Board of Governors of the Federal Reserve in Washington, D.C. The deposited capital entitles the bank to a corresponding share of “stock” in the regional Fed. The stock is not like regular common stock: it can’t be traded, sold, pledged as collateral, gifted to family members, shorted, or aggregated to effect a takeover. It’s this “stock” that’s receiving the risk-free 6 percent dividend from the Fed. This corporate welfare program gets even better: if the shares of stock were acquired prior to March 28, 1942, the 6 percent risk-free dividend is tax exempt and the bank doesn’t have to pay corporate taxes on it. Most of the biggest banks on Wall Street can trace their banking charters back much further than 1942. In the case of a Wall Street powerhouse like JPMorgan Chase, its banking roots date back to the late eighteenth century. Aaron Burr founded The Manhattan Company (predecessor to Chase Manhattan Bank) on September 1, 1799 at 40 Wall Street. The precursor to Citibank, the commercial bank owned by the formerly taxpayer supported Citigroup, dates back to the founding of City Bank of New York in 1812. According to a report from the Federal Reserve, “As of March 2004, of the nation’s approximately 7,700 commercial banks, approximately 2,900 were members of the Federal Reserve System.” That means billions of dollars in overly generous dividends are being paid to a lot of banks that were just bailed out by the taxpayer four years ago. These ridiculously high dividends relate directly to our national deficit and the current debate on shared sacrifices. Any excess earned by the 12 Federal Reserve Banks after these dividends are paid is turned over to the U.S. Treasury and can be used to retire government debt. If the dividends were cut to 1 percent, commensurate with what other investors are receiving, billions more would be available to the Federal government. Ending the tax subsidy on the dividends would add billions more to government coffers over time. The 6 percent dividend is only one piece of a monster corporate welfare program being conducted by the Fed on behalf of the banking industry. Unknown to most members of the public is that the Fed is providing a nanny and butler service to banks – including those lavishing obscene bonuses, executive pay, and retirement perks like corporate jets and luxury offices on their departing CEOs. The Fed provides enormous economies of scale to the U.S. banking industry by offering the following services at low cost or, in some cases, no cost: wiring funds, wiring securities, delivering and picking up currency and coin to bank branches, redemption and servicing of savings bonds, issuing securities to the successful bidders in Treasury auctions, a custodial inventory program for banks that want the Fed to maintain the inventory of currency held in their vaults, and a National Settlement Service for banks that settle trades on behalf of clearinghouses or stock exchanges. And, of course, one of the most expansive and vital services is check clearing. The Check Clearing for the 21st Century Act (Check 21), implemented in October 2004, has virtually transformed the check collection system. In only six years, the industry has moved from a predominantly paper-based environment to one where at some point in the collection process, almost every paper check is converted to an image. At the Federal Reserve Banks, over 99 percent of deposits and over 95 percent of presentments are exchanged via electronic images. Recently, the Federal Reserve Banks embarked on an initiative to modernize the System’s Check platform. This effort will result in a fully centralized processing environment to support high-quality efficient check processing while providing a flexible and scalable infrastructure. Migration to the new platform is targeted to occur in mid-2012 and is expected to have minimal impact on our customers…For your convenience, information regarding the Check Platform Modernization initiative will be posted at www.frbservices.org. As always, feel free to contact Check Customer Support at 877-372-2457 with any questions. We appreciate your support and look forward to continuing to provide you with efficient, high-quality payments services. 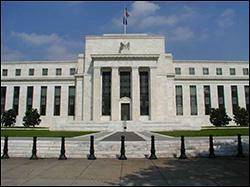 Many of the services provided by the Fed are essential to a safe and efficient banking system in the U.S. But the Fed should end its corporate welfare program by dramatically reducing the 6 percent dividend and charging market rates for its services to banks. Of even greater concern, an institution which views banks as its “customers” for whom it must be “driving customer value,” has no business also serving as a key regulator and auditor. That deeply conflicted role had a hand in the 2008 crash, in the obscenities of the ensuing bailouts, and is making a joke of the Nation’s central bank.